Forging(Hada): Forging mark is minute Ko-Itame wooden grain, using steel of superfine quality. Hiraji surface is covered with uniform, sparkling glitter so called Ji-Nie - crystallized mist and darkish Nie dots so called Chikei activity gushes out from steel. Shinogi-ji surface shows Masame straight grain mark. Temper(Hamon): Hamon starts with short slope "Yakidashi" then Choji clove shape mixing with Tad-pole style Choji or Gunome. Temper Splashes over the surface to generate Hitatsura speckled pattern. Tang(Nakago): UBU, One peg hole. Greatly Slanting left (O-sujikai) file marks. V-shape (kengyo) heel of which bottom shows Kiri file marks. 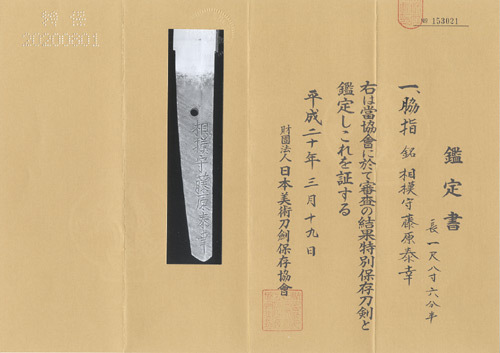 Back of Nakago shows Greatly Slanting left (O-sujikai) and Horizontal Kesho file marks.The signature on Haiomote starts with an official district Sagami-no-kami 相模守 title, the clan Fujiwara 藤原 then smith name YASUYUKI 泰幸. The 1st generation YASUYUKI 泰幸 who was born in Mino domain, had moved to Minami-Nagashima-cho, Nagoya after Nagoya castle relocation in the 2nd month, the 15th year of Keicho(1610). He obtained official district title "Noto-no-kami 能登守" and research material shows the date of year kanei 8, 13, 15, 18 and 20 (1631-1643). This wakizashi is the work of 2nd generation YASUYUKI 泰幸, who enjoyed Sagami-no-kami 相模守 title. His real name is SHINBEI 新兵衛. 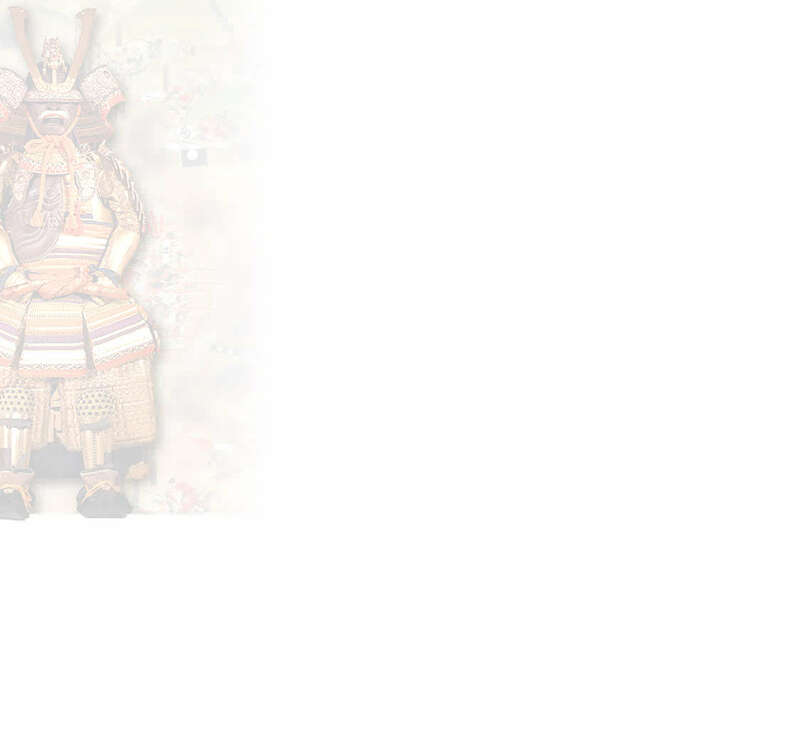 There are some research materials that shows the date of year Kanbun 5, 7, 8, 10 (1665-1670). As compared with the work of 1st gen., his works show thicker and deeper the chisel of signature and file marks is deeper as well. The heel shape is V-shape whereas one of 1st gen. is Double-bevelled (Kurijiri). 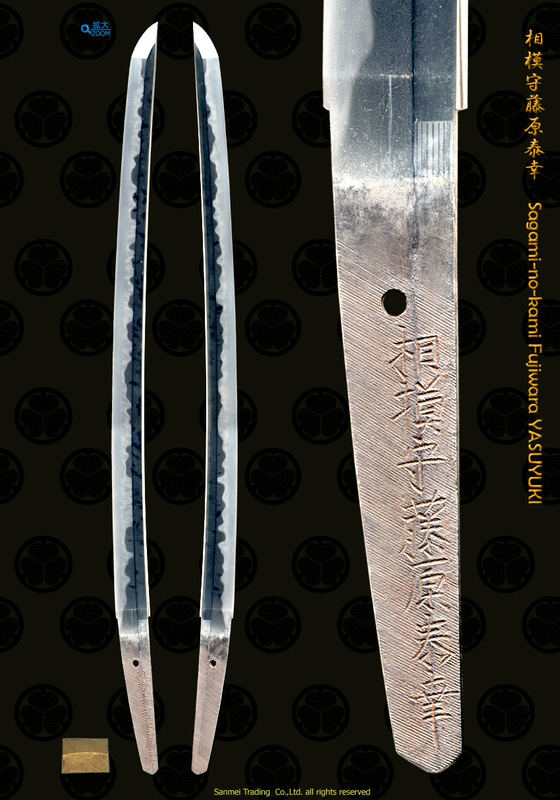 This wakizashi, it is stout with outstandingly wide mihaba and exceedingly thick in kasane and quite heavy on hand. Reference to the workmanship of superfine quality steel, delicate forging and peculiar quench method of "Hitatsura - speckled temper", it is understood that this is a custom made wakizashi and being treasured in generations by Owari Samurais who celebrated for their valor. Nakago holds a supreme taste of patina, remains clear filemark and chisel of signature.This is one of his masterpieces perceptively. Double layer gold foiled Habaki collar, Preserved in a Shira-Saya plain wood mounting. An old good polish/Condition scale: mint-excellent (using a scale of mint-excellent-very good-good-fair-poor).